01. "Jersey Shore (Program Advisory)" (6/26/2018) - a parody of one of the network announcements when they are substituting a special in place of a regularly scheduled program. 02. 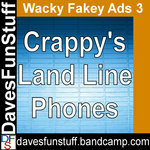 "Crappy's Land Line Phones" (released on 9/12/2009) - let's go back to the simpler days where telephones were once on a cord. 03. "Mac vs. PC Spoof: Reagan vs. Gorbachev (alt music)" (released on 6/26/2010) - what if it was 1985 when these two once ruled their own countries and they did this conversation in the style of a Mac vs. PC commercial? 04. "Achoo Sneezing Powder" (2006, released on 7/31/2007) - still another Wacky Package come to life. 05. "Today on ABZ" (released on 10/28/2009) - what TV seems to be like on ABC. 06. "Mac vs. PC Spoof: Atari vs. Intellivision (alt music)" (released on 6/26/2010) - this time, it's 1981, and the Mac vs. PC style invades the early video game console battle. 07. "Glenn Beck Easy Hang Up (celebrity voice impersonated)" (released on 6/26/2010) - this sendup of a device you attatch to a telephone features a radio talk show host who had a meltdown on the air. 08. "Crappy's Rabbit Ear Antennas" (released on 9/17/2009) - ditch expensive cable and return to free TV! 09. "Mac vs. PC Spoof: Coke vs. Pepsi (alt music)" (edit) (released on 6/26/2010) - it's the cola wars Mac vs. PC style! 10. "Earl Lieb's Meat Market (no music)" (released on 10/28/2009) - a send up of those meat slaughterhouse businesses. 11. "The CW Fall 2009 Lineup (no music)" (released on 10/28/2009) - recycling old ideas is the theme of the network. 12. "Mac vs. PC vs. Stan (alt music)" (clean) (released on 6/26/2010) - a tribute to the genius advertising mind of Stan Freberg. 13. "Mannah Fontana Products" (released on 9/27/2009) - could Hannah Montana canned squid be far behind?